Photos Copyright 2016 James Cavanaugh. Fichte Endl & Elmer Eyecare opened their new office in the Town of Niagara on September 3, 2015. The $7 million improvement project allowed Fichte Endl & Elmer four new exam rooms (totaling fifteen), testing rooms, and a conference center. The 21,000 SF building is now wheelchair accessible with an updated lobby featuring an atrium and modernized optical boutique. The facility’s interior work features high ceilings and excellent access to natural light. 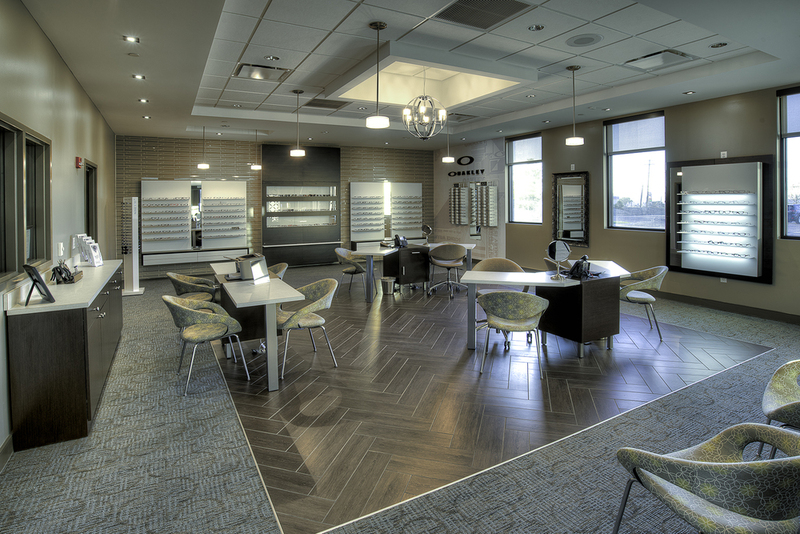 As an eye care facility their focus is on what one sees, so great lengths were taken to make sure there is variety and beauty in the space. Many of the finish selections play off of an ocular theme, from eye shaped glass tile at the fireplace to the decorative wallpaper, fabric patterns and even the orb shape light fixtures. The reception desk is an inviting space with intricate wall coverings that pair perfectly with the tile on the main wall. Planters were added to give the space life. The firm was praised by Kathy Otto, Coordinator of Marketing and Outreach at Fichte Endl & Elmer, saying, “Thank you for all your hard on interior design you have done for us. Our building is aesthetically AMAZING because of you and your team! You have been a pleasure to work with and we cannot imagine taking this on without the help of such highly regarded professionals as yourselves!"